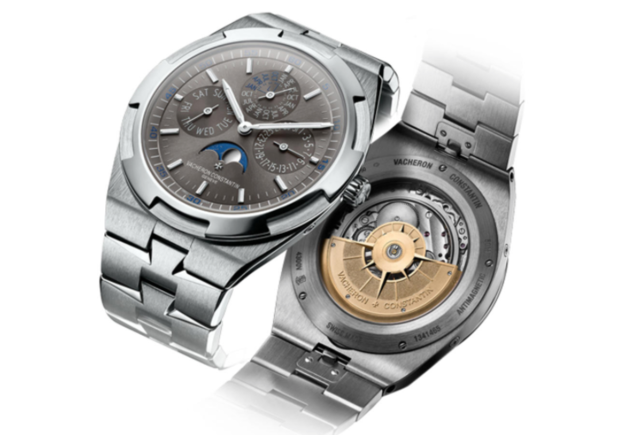 Vacheron Constantin is honoring the 20th anniversary of the Overseas this year. Destined for the sophisticated traveler, the collection of five new models and 12 references—as well as three new self-winding manufacture calibers—features interchangeable straps (leather, rubber or metal) with an ingenious tool-free device to secure them. Each watch is bestowed with the Hallmark of Geneva, which is also celebrating an anniversary this year: its 130th. One of the stand-out pieces is the Overseas Ultra-Thin Perpetual Calendar. The watch is powered by the Caliber 1120 QP. The 41.5mm white gold case holds the iconic Caliber, an amazingly slim feat for a Grand Complication watch. The case is also only 8.1mm thick and features a soft iron casing ring ensuring anti-magnetic protection. Looking at the back, there is a transparent sapphire crystal caseback. The translucent grey-lacquered dial also has a sunburst satin-finished base with velvet-finished minute track and 18k gold hour-markers. With the watch, the wearer receives a white gold bracelet, hand-stitched alligator leather strap and black rubber strap. The in-house Caliber 5200 powers this bright blue dialed watch. As Artistic Director, Christian Salmon says in the video above, the Vacheron customer is someone who wants to go to the theatre and maybe play a quick tennis match. Customization is vital in the new watch world and the strap system with the Overseas is one of it's biggest selling points. The 42.5mm stainless steel case features the 5200 with a power reserve of approximately 52 hours. The watch also is available with a silver-toned dial if the wearer isn't too conspicuous. 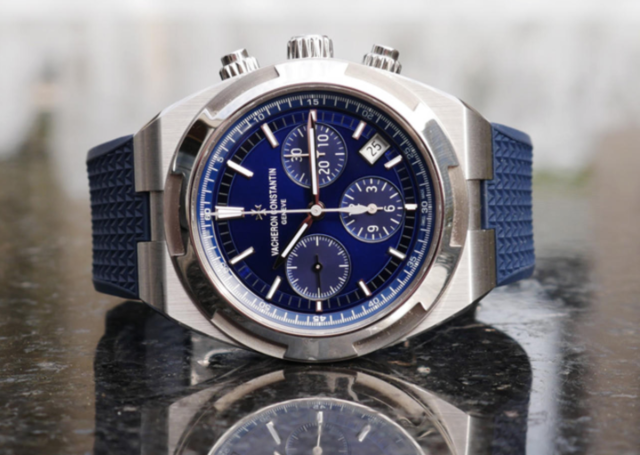 Take a look at Justin Mastine-Frost's On the Wrist reviews of the Overseas Chrono and the Overseas World Time.